Thank you so much for giving us a Ganapati Darshan. Special Thanks for the Acharya Galli which is “namma Galli”. Thanks a ton.. u made my day. I was doing my engineering and we had a ganesh pendal just beside by house. I remember always reading full high volume of ganesha. I just can not forget the childhood days. It was amazing. Hi Thanks a ton for all the pics… miss all the celebration in belgaum. Hi, I am staying out of Belgaum… Please upload all ganesh photos. Specially from somwar peth tilakwadi, Belgaum.. The cover photo/1st photo is Somwar peth ganesh idol. GREAT JOB Mr Uday keep its up . I am also form belgaum working in Manglore . Its was great to see all the Ganpati at one time . Mr Uday I request you to upload the max pics of ganesh veserjan belgaum .Even I can enjoy the vesrjan after seeing the pics . Please try to upload photo of Angol Area also. You have covered all the city area, but you have only left angol area. Thanks for presenting Ganesh Darshan of Belgaum. Keep on adding more photos. Thank you all for carrying forward the tradition of celebrating Ganesh Chaturthi in a grand way. I am from belgaum. Now I am working in Bangalore. Really you are doing fantastic job. Please upload Ganapati Photos of Gavali Galli and Kangral Galli it is in the heart of the city. Sir last time also you forget to add the photos. please atleast this time upload the same. You are really done a good job for all those who are living away from Belgaum. I am basically from Uppar Galli, Khasbag Belgaum. Every year I use to visit Ganapathi festival but this year I could’t. 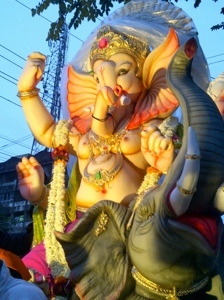 But I saw maximum galli ganapathi’s of Belgaum through net, because of your great job. Sir … all are nice picture of Ganapati Bappa. but nanawadi ganapati is not there. check the ganesh murti in nanwadi, its very nice. Great pics. Can u upload some pics taken at night with full lighting ?